Irrigation efficiency involves the ability to minimize water losses. Such factors as loss of water from wind drift and evaporation from the soil surface and plant affect the level of efficiency. Meanwhile, another factor of irrigation efficiency is simply getting water into the soil, and controlling runoff. 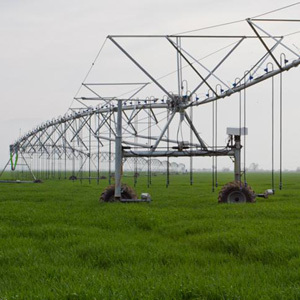 For mechanized irrigation, the biggest single advancement towards increasing irrigation efficiency has been mounting the sprinkler down out of the wind on drop tubes. Enabling the success of drop tubes are products that spread the water out over a wide area, even when mounted below the truss rods of a center pivot. These rotating, spinning and wobbling devices operating at low pressure have dual benefits, increased soak time and low application rates. A more complete throw pattern can give twice the soak time of fixed sprayheads. Without sprinkler performance that can apply water at an application rate less than the infiltration rate of the soil, the efficiency gained is soon lost to runoff.Average application rate (AAR) is the rate of water application over the wetted area. It is an average value assuming uniformity within the wetted area. Pivot average application rates increase with the higher flow demands required at the outer portion of a center Pivot. By increasing the wetted throw distance of the sprinkler, AAR can be reduced to match the soil’s infiltration rate. Instantaneous application rate (IAR) is also an important element of sprinkler performance especially for silt type soils that are prone to compaction. Instantaneous application rate (IAR) is the peak intensity of water application at a point. IAR and droplet kinetic energy are important variables in maintaining good soil intake rate throughout the season. Pivot sprinklers that produce high instantaneous application rates with high velocity, large droplets are detrimental to some soils types causing surgace damage by sealing off the soil pore space at the surface. The rate of instantaneous application for a fixed stream type sprinklers can be more than ten times the average if measured at the instant the stream hits the soil. The problem comes when some surface damage occurs, sealing off the soil pore space at the surface. The best condition for infiltration is to keep the soil surface open, and apply water using a wide applicaiton width. Another sprinkler technological advancement is the use of dual nozzle clips. This allows two system flow rates to be used on the same machine, allowing use of lower flow rates to march Crop ET (Evapotranspiration) rates during germination, when water requirements are low. Innovations like the 3TN Dual Nozzle clip allow irrigators to reduce Average Application Rates during germination or the early stages of a crop’s growth curve. The 3TN Dual Nozzle Clip holds a secondary nozzle, allowing quick and accurate changes of system flow rate. Lowering average application rates reduces ponding of water and potential erosion, while maintaining the integrity of the soil structure with less intense water droplets.